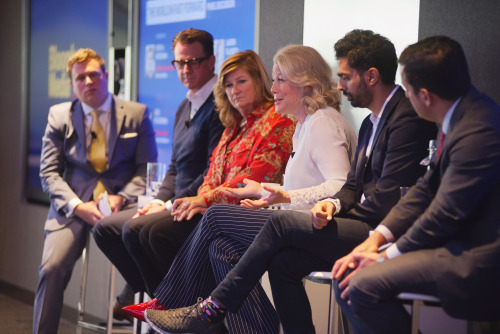 Authenticity, relevancy, values – amid an era of technological disruption and changing business models, those were the ideas that came to the fore at Bloomberg Media’s second annual Global Leadership Breakfast during Advertising Week New York. 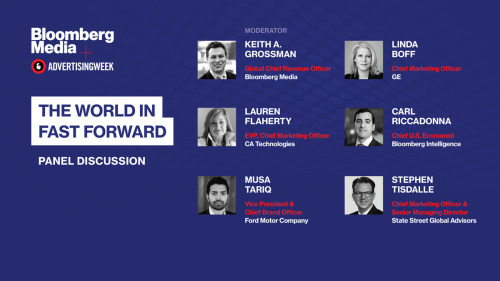 Moderated by Bloomberg Media CRO Keith A. Grossman, a panel of brilliant marketing minds – Ford Chief Brand Officer Musa Tariq, GE Chief Marketing Officer Linda Boff, CA Technologies EVP, Chief Marketing Officer Lauren Flaherty and State Street Global Advisors Chief Marketing Officer Stephen Tisdalle – offered a powerful look at why such uniquely human qualities matter more than ever to businesses. Bloomberg Intelligence Chief U.S. Economist Carl Riccadonna set the stage for the panel’s discussion with a briefing on macro-economic trends. The current economic cycle shows no sign of ending any time soon – but growth is just above what Riccadonna called “stall speed,” the point below which the economy could take a nose dive. Most of that growth comes from consumer spending, he added – so whatever affects income in turn affects growth. New business creation is rising slowly; and employment has also risen, which could give incomes and growth rates a boost. 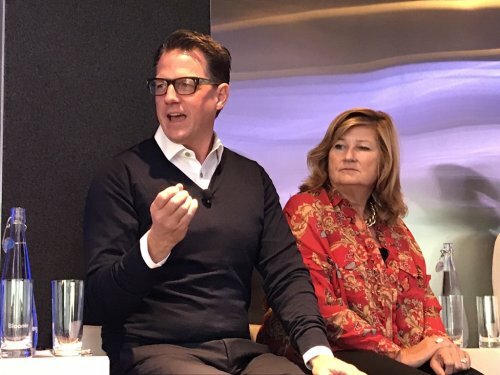 Against that backdrop, the panel’s marketing leaders emphasized the need to deeply understand and live your brand’s values. “The greatest risk is not embracing who you are,” said GE’s Linda Boff. For GE, that means remaining true to a brand identity that stretches back to Thomas Edison – while taking action to express that in bold, unexpected ways. 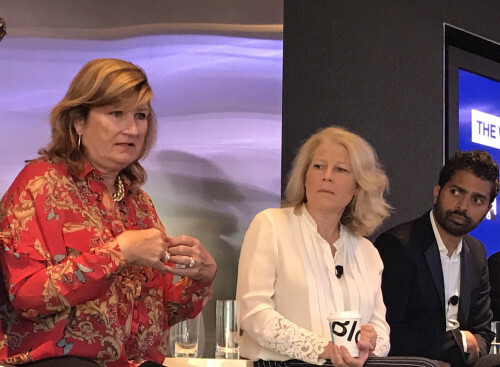 One way she and her team recently did just that was with “Balance the Equation,” an effort that both galvanized and celebrated GE’s commitment to increase the number of women employed in technical positions. A three-day installation at New York’s Grand Central Station projected the images and accomplishments of 12 female scientists and engineers as re-imagined stars on the station’s famed ceiling. “Fearless Girl,” the Wall Street statue created by SSGA that became a viral sensation, demonstrates that unequivocally. The extraordinary success of “Fearless Girl” is, like GE’s “Balance the Equation,” grounded in a core brand value, Tisdalle said. The company holds a deep-seated belief that “greater diversity of thought and leadership produces better returns over the long term,” he said. The statue embodies that idea, he added, in a way that is simultaneously bold and aspirational. In the age of radical transparency fostered by mobile phones and social media, taking action that leads the way speaks louder than the words of more traditional marketing campaigns. “You don’t own your brand anymore,” said Ford’s Musa Tariq. Conversations that influence the perception of a brand can begin in many different places, among many different constituencies. 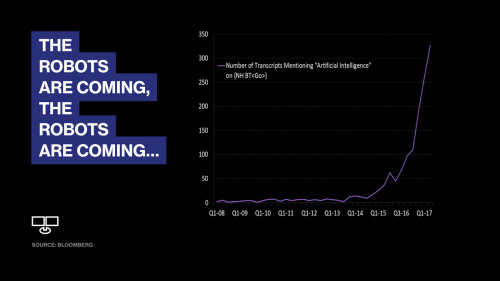 If you’re doing lots of things as a marketer, he added, you’re starting those conversations. That change has made marketing integral to every part of the business, from product development to sales to human resources. It has also reset the agenda from what a business needs to what its customers need. “It’s ‘how am I helping you,’ not ‘how am I selling to you,’” Flaherty said.